This article will walk you through connecting to your account via SSH in cPanel and using programs like Terminal (Mac). You can follow cPanel’s documentation to connect using PuTTY (Windows). You’ll be automatically logged into your account where you can start running commands. While Terminal is a new application for the cPanel GUI, it is a great option is a user needs to use SSH capabilities very rarely. It can be useful as a one-time use but, the best option is to connect via an external client like Terminal or PuTTY (linked above). First, take note of youcPanel username and password. 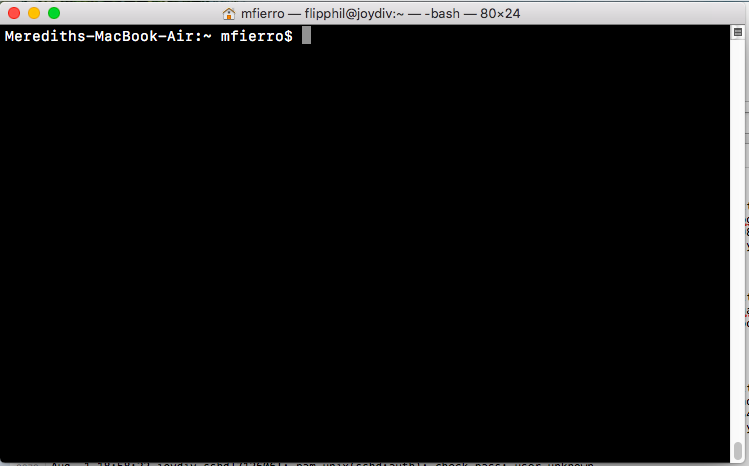 Then, open terminal on your Mac. You can find this application in your Applications folder or in the Launchpad. Once open, it will show you’re connected to your computer locally. Type in your password. The screen won’t show the password for security. Press ‘Enter.’ **If this is your first time connecting to the site via SSH follow the prompts on to add the key to your computer. And that’s it! You can always reach out if you have a question about connecting or you run into any issues along the way.